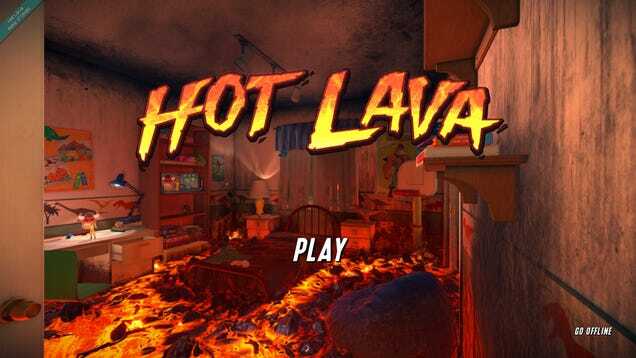 Hot Lava is what happens when your childhood imagination runs rampant and tries to kill you. The people at Klei Entertainment are behind this parkour focused, Trials-esque game, and I am holding them directly responsible for my conflicting feelings of joy and anguish. The intro sequence of Hot Lava is effective at establishing the tone of what’s to come. What began as me just playing with action figures on the couch, instantly escalated to my entire home being overcome with lava. Luckily all of my furniture and toys seemed to be flame retardant and strewn about in such a way that I could just platform my way out of that nightmare. After some jumping and swinging across what once was a home, a fire demon revealed itself to be the catalyst for all of this mayhem. It took a big swing at me and everything went black. Moments later I regained consciousness in a now emptied out classroom that my character must have fallen asleep in. Once I regained control I found that I was now in the hub world of Hot Lava. It’s an unassuming grade school that for the moment, was noticeably devoid of any lava. After getting turned around a bit, I eventually found my way to the gymnasium where I found out that I was not alone. Some other players had spawned into my game, all of them equally as confused and disoriented as I was. We eventually found our way to the gymnasium, where on top of the bleachers was a large fiery red door with a name and some stars on it. It was my gateway to some tutorial levels where I learned about jumping, wall running, swinging, air control and more. Once completed, I was told I had missed some collectibles and the faster time requirements to get all the stars. Every level from here on out was presented in this way, encouraging you to replay them until you had completed all of their challenges. Now back in the school, it’s revealed that a new level has opened up... somewhere. It takes some doing but I eventually found it. This would be the routine for me every single time a new level unlocked. The hub world was unnecessarily difficult to navigate once I started unlocking numerous challenges and levels at once, but it wasn’t impossible. Controlling the game itself was an entirely different matter however. It ranged from supremely frustrating when I was bouncing off of the tops of slanted lockers for discernible no reason, to insanely satisfying when I started stringing together long lines of jumps and swings. In the few hours I spent with Hot Lava, I never quite felt like I was 100% in control of my movements. I’m sure that with time and practice that will change and I won’t fall into the orange abyss as much. Luckily respawning at a previous checkpoint was a button press away and basically instantaneous. That is until I got to, the bane of my existence, the “Chase the Grade” challenge. In this challenge, I had to keep up with a floating letter that would change from A to F depending on how far away I was from it. But not only did I need to keep up with that constant reminder of my imminent failure, there were no checkpoints in that level. Every bit of confidence in my abilities was chipped away piece by piece with every death I suffered. To make matters worse, the other players that would load into the level with me would clear it in one or two tries. Not only am I not good at this challenge, but now I feel bad about it too. Thanks guys. Outside of that nightmare challenge, there was some light character customization that involved new accessories, hats and sprays for use on any of the 4 unlockable characters. While I did obtain these cosmetics via a loot box system, there didn’t appear to be anyway for me to buy them with real money. I could only buy a loot box through in-game currency that I collected from completing levels or just finding it in the levels and hub world. Hot Lava is very clearly not finished though and any complaints I have with it’s current form could still be ironed out. It’s currently in an open beta that you can just download on Steam right now, and I definitely think it’s worth your time.